The man was shot at least three times. Forensic officers and gardaí at the scene of yesterday's shooting. A MAN SHOT at least three times in Dublin yesterday remains in a critical condition. 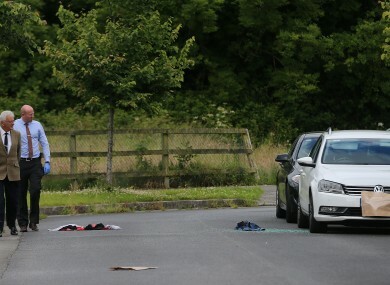 The man, named as 38-year-old Christopher Maguire, was shot as he sat in a car outside his home in the Dun Emer estate in Lusk, north county Dublin. It is believed Maguire placed the call to emergency services himself. It is not yet known if the shooting is linked to the ongoing Hutch-Kinahan feud, but Maguire is known to gardaí. He was taken to Beaumont Hospital, where he remains. A Volkswagen Golf was seen leaving the area and was discovered burnt out at nearby Kilhedge Lane, Lusk a short time later. They are asking anyone who was in or around the Dun Emer area or Kilhedge Lane, Lusk yesterday morning and who may have seen anything unusual to contact Balbriggan Garda Station on 01 – 802 0510, the Garda confidential telephone line 1800 666 111 or any Garda station. Email “Man remains in critical condition after being shot in Dublin”. Feedback on “Man remains in critical condition after being shot in Dublin”.